This post is about indexing an External Database in Sitecore. 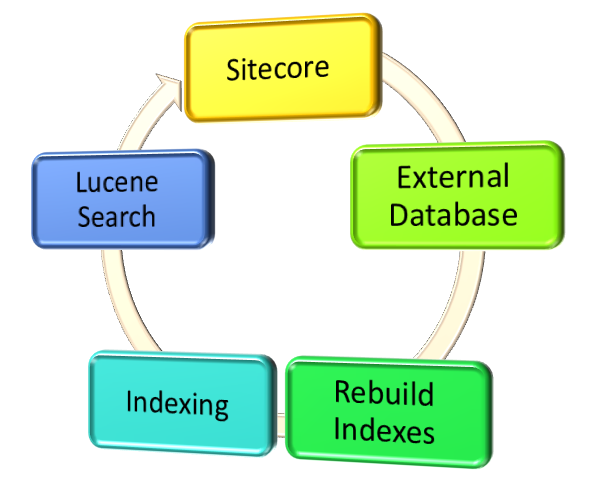 So will index data of external database tables and use LUCENE search to get result from index files. 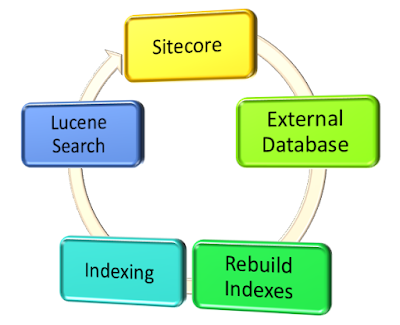 If you are new to LUCENE search, please refer my article on Lucene search. I setup most of the things according to this post and its work like a charm. However for Sitecore 8.0, I need to do below changes. You need to add reference of Sitecore.ContentSearch.dll, Sitecore.ContentSearch.Linq.dll, Sitecore.ContentSearch.Linq.Lucene.dll and Sitecore.Kernel.dll. I added my fields in "<fieldNames hint="raw:AddFieldByFieldName">" section in Sitecore.ContentSearch.Lucene.DefaultIndexConfiguration.config. That's it from Sitecore point of view. After this next challenge is how to rebuild/refresh index for any DML operation done on external database tables. For this you can refer my article "Rebuild Sitecore index on real time basis from external system". Index rebuild process takes time on Sitecore side. So you must call index rebuild method in async function in C#.